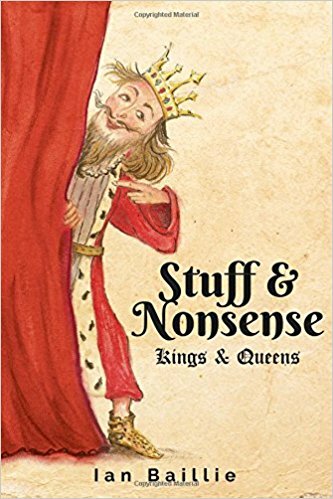 Ian Baillie’s “Stuff and Nonsense” is an irreverent look at English kings and queens in comic verse. If you want to know who came where and when in our list of Royals this is a fun way to do it. Did you know that James II’s brain is preserved in a bronze urn in Paris? Who was Hugh Despenser and what was his sorry and brutal end? It’s took a long time for royals to settle their differences without resorting to the sword or the executioners axe. And a lot of strife was down to religion. Presented in a modern style, the book comes supplied with references and notes which help the reader solidify each historical figure with the fact an anecdote. This fun little book is perfect for either students just learning about the history of English monarchy or adults who have recently found a passion for the topic. Starting with William the Conquerer, going all the way through King George VI, author Ian Baillie teaches you about each monarch through rhyming. After each poem there are notes/reference to follow up on the accuracy of each monarch. When I first picked it up I felt like it was a silly book, but after awhile I realized it was a fun change of pace from the novels I normally read. Rhyming your way through history IS actually fun and everyone should do it. This book would be a perfect gift for someone that you know if a fan English monarchy or for someone just getting started. I’d rate this book five out of five stars and recommend it once again for a perfect gift idea. To be honest, prior to finding this entertaining book I really felt the history of the British monarch was mind-numbingly tedious! But learning about them via unusual but revealing character traits brings them to life! A friend bought me the book but didn’t seriously expect me to read it, let alone enjoy it! Well – ha – the laugh’s on them!! Highly recommended, 5 stars, whatever! !